Free Frank Warner: VI Day - Victory in Iraq! 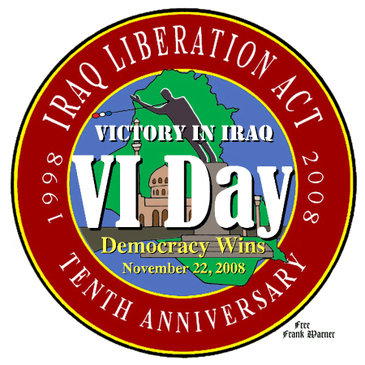 VI Day - Victory in Iraq! T Y R A N T S A R E D E F E A T E D . A P P E A S E R S A R E S H A M E D .
F R E E D O M I S T R I U M P H A N T .
The U.S.-led coalition, which chased Saddam’s invaders from Kuwait in 1991 and toppled Saddam’s fascist regime in 2003, now has secured Iraq’s first democracy. Thanks to the sacrifice and courage of millions of Americans a long way from home, the Iraqi people are free. Let’s salute these liberators as the heroes they are. They stood for us democrats in the war for freedom, and freedom won. Today, we celebrate. It’s Victory in Iraq Day! I don't thnk Obama is all that shamed, having ridden opposition to Iraq into the White House thanks to voters like you. We'll see what he does with the victory. Let us say rather that it is a republic -- if they can keep it. There are at least some discouraging signs.